The Falcons are 3-2 and in third place in the Pacific Conference after a difficult start to the year. In the wake of last year's trip to the state playoffs, the prospects of a new and more competitive league, and with some momentum provided by an historic run to the state quarterfinals on the gridiron, the Liberty Falcons and head coach Brian Martin had big things in mind for the 2018-19 boys basketball season. Then it started. And despite the excitement the coach and his team were swimming amidst at the "Liberty Late Night" event to kick-off the year, that enthusiasm quickly went south as the result of a 2-10 nonleague record, including losing streaks of six straight and eight of nine prior to their league-opener against Sherwood. It was at that time, a frustrated Martin and his coaching staff stepped back and evaluated what and why things were happening as they were, and boiled it down to two simple concepts: defense and possession. "During the nonleague season we got a good look at what we needed to do and we simplified it to two things: contain your main and keep him in front of you, and the second was value the basketball," said the coach. "Don't turn it over and make sure every possession we get a shot up. If we do those things good things will happen, and in league, we've really zeroed in and it's working." Since that league-opener against the Bowmen, Jan. 9, Liberty had won three of four conference contests prior to last Friday's 61-49 loss to second place Forest Grove. Following the loss to the Vikings, the Falcons sit at 3-2 in the Pacific Conference and tied for third, a far cry from their dismal nonconference slate and looking forward with the heightened expectations that have come with their recent resurrection. "Wins cure a lot of things," Martin said. "They have a little success and they want to go a little bit harder, then they win a couple more and they want to keep going." Tyler Rockwell, a junior wing for Liberty, agreed with his coach's assessment of not only how things were, but have been in recent weeks, and added that a lineup tweak aided in the expedition of a couple relatively simple concepts. "Nonconference we were slow out of the gate and couldn't figure out how to get consecutive stops and turn them into buckets," said Rockwell. "I think that changed when coach switched up the lineup. It's been the same since league started, and it's been 'keep your guy in front of you and value the basketball,' and it's led us to wins." Martin cited Rockwell, along with Aiden Maloney, Jaxson Lake and E.J. Estocapio as just a handful of players that have driven the change, both physically and philosophically, helping to get the entire team on board with the fundamentals behind their recent rise in the standings. "Aidan Maloney has shown us the way in regards to containing guys, along with E.J. (Estocapio) and Jaxson Lake also," Martin said. "Those three guys have really shown what can happen when you keep guys in front, and when you have a group of guys doing it, the guys that aren't maybe take it a little bit more personal." With their 3-2 conference start, the Falcons see light at the end of what they hope will be a postseason tunnel. A change in the OSAA's playoff structure, coupled with their new mindset, has given Liberty a realistic shot a playing beyond their seven remaining regular season games. Something Martin hopes his team will see as motivation over the team's final month. "The neat thing about how the OSAA has set this up this year is if you finish in the top-3 in your league, you're in the playoffs," said the coach. "So it doesn't matter what you did in the preseason. You're able to kind of wipe that away, and all that pretest stuff we learned, we can learn from that. We had 12 games to see what we could do, and they took to that." And how would Rockwell assess where they are and how they attack their remaining seven games? "I think we're really buying in," he said. "You can see the guys on the bench are more into it, and in our game against McMinnville guys were really engaged and buying into what coach was saying. We get another chance against Forest Grove and have been battling, so were ready for what's left in the season, for sure." 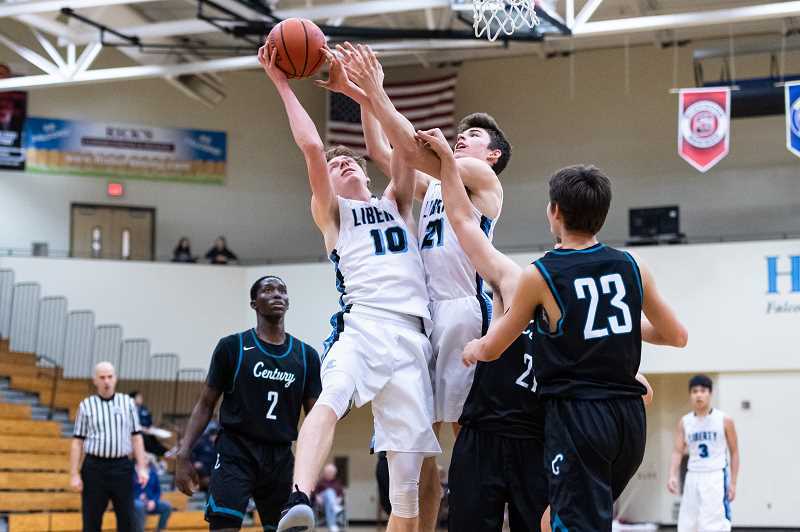 Liberty hosts Newberg Wednesday, Jan. 30, at 5:45 p.m., and travels to Century, Feb. 1, for a 7:15 p.m. contest at Century High School.